Ruskin Elementary School - Welcome to RukinFIT! You Are Here: Home Get Ruskin Fit Welcome to RukinFIT! The Governor's Council of Physical Fitness issued a challenge for school children to exercise 30 to 60 minutes a day, three days a week for a month. Ruskin Elementary Students did, and now they have a $1,000 check to show for it. Part of the students' commitment to exercise means exercising when they're away from school as well. Enrico Amutan, Governor's Challenge Coordinator, and Randy Lee, RuskinFIT Coordinator, said that Ruskin students are committed to exercising and their teachers are ready to keep things interesting. The plan is to get more fitness equipment, get more parents to volunteer, and even bring in high-profile speakers to talk about fitness. On February 27, 2008, Ruskin won the Front Runner's Prize of $1,000.00. Since then, Ruskin has won the Front Runner's Prize again, in 2010. Today, Mr. Lee continues to oversee the RuskinFIT program as it continues to provide playground equipment for all students to use, partner with Nike Store (Great Mall) "athletes" to encourage student engagement in various recreational games, and share opportunities for the Ruskin community to stay active and healthy. 1) Obey all adult supervisors' instructions. 2) Use the equipment for its intended purpose (i.e., hula hoops are meant to be used around your waist, not your neck; jump ropes are meant to be swung by one handle). 3) Include others in your play. 4) Return each piece of equipment back to the rolling cart after you are finished with it. 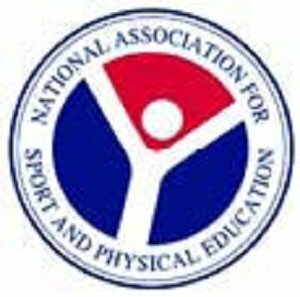 For more ideas click on the link to the left to get a RuskinFIT Calendar of activities from the National Association for Sport and Physical Education (NASPE). We have joined the from the Santa Clara County Office of Education and we hope that you support our mission, for more information ont he Fit for Learning initiative click the logo.